They do not require secondary pieces because they are self-retaining and are held by spring tension. Not easily loosened through vibration, spring clips are often used in automotive applications. Also able to compensate for tolerance buildup and misalignment, spring clips are generally configured to work for specific applications. Although plastic clips have become more widely used than metal clips, metal clips such as spring metal clips, are able to handle higher holding capabilities. In addition, certain metal clips, such as stainless steel spring clips, offer much better resistance in environmental conditions compared to many types of plastic clips. Spring clips are useful in a wide range of applications, such as fastening cables, molding trim, gaskets and fabrics as well as in assembling cover panels, hinged components, flange and channel assemblies and armored cable. Spring Clips – Micro Forms, Inc.
As a result of their wide-ranging applications, spring clips are advantageous in numerous industries including marine, military, apparel, aerospace, commercial, telecommunications, electronics, agricultural and appliance. Spring clips are formed during the metal stamping process; metals that spring clips are typically formed from include carbon steel, concrete wire, cold rolled steel, brass, bronze and aluminum. The type of the material affects the application of the spring clip; metals like aluminum are for light-duty applications while metals such as cold rolled steel are for heavy-duty applications. Since spring clips are small, precision parts they are generally formed during progressive and fourslide stamping processes. Both of these processes are types of short run stamping, which is done as a part of a one continuous process and is used to produce high volumes over a short time span. Progressive stamping utilizes presses with multiple stations which stamp different attributes into parts as a metal coil moves through the press; spring clips are cut and separated on the final step. In the fourslide stamping process, presses with four moving slides are used, which allow the automated press to manipulate parts along both axis. This allows for multiple aspects of stamping, cutting and shaping on spring clips to be completed at one processing stage. Spring Clips – Talan Products Inc. There are also several different configurations of spring clips including u-shaped clips, s-shaped clips, dart-shaped clips and c-shaped clips. U-shaped clips are mainly used for assembly of products such as glass panels, wire and cables and flange assemblies. S-shaped clips are often used to fasten panels and flanges either in line with one another or at an angle with the clips. They are also highly useful for assembly of soft materials in hard-to-reach areas. Dart-type springs are most often used to join two panel surfaces, such as refrigerator liners, but can also be used in various fastening applications. Easily removable, dart-type clips require a mounting hole and space for the dart behind the mounting panel. C-shaped springs offer compression action, which is typically used to hold plastic knobs onto steel shafts as well as enabling the ready removal and reuse. 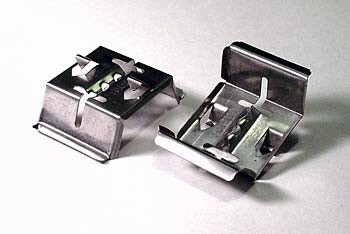 Spring Clips Spring clips are one-piece fasteners that slip into holes or onto edges.